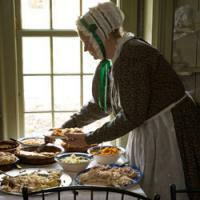 Join Old Sturbridge Village and experience the traditions of an early 19th-century New England Thanksgiving. Learn about 1830s dining etiquette and watch the men of the Village compete in a post-dinner target shoot. Smell the scents of roasted turkey and pies warming by the fire. Learn about Native American Thanksgiving traditions and customs, and hear the minister talk about the real meaning of Thanksgiving in the Village’s historic Center Meetinghouse. Discover Native American foodways and their unique Thanksgiving connections. Visit with the Indian Doctress as she shares Native traditions of giving thanks. Marvel at the marksmanship of local villagers as they compete for bragging rights and other traditional prizes during this unique 19th-century Thanksgiving social event. The shooters will use traditional smoothbore flintlock muskets. There will be a gun available from time to time for young shooters to examine – without powder, of course. Friday Thanksgiving Feast Buffet at the Oliver Wight Tavern. Thanksgiving was a time of celebration and family reunions. With everyone gathered together it also became a favorite time to celebrate a wedding. Visitors will get a chance to talk with the couple in the morning during their prenuptual preparations. In the afternoon, hear readings from the diaries and letters that document their star-crossed courtsthip and then watch the couple exchange vows. Purchase your tickets online in advance to expedite your entrance into the Village. Add an overnight stay at the Old Sturbridge Inn and Reeder Family Lodges. Find more useful information for planning your visit.